The thorny devil (Moloch horridus) has spiny orange yellow and black skin with a pretend second head on the back of its neck. They lift their tail and walk along with slow, jerky motion like a wind-up toy. The thorny devil is diurnal (active during the day time). The spikes all over their bodies help them get a drink of water in the dry sand country. In the mornings they rub up against dew drops on the spinifex and the moisture runs between the spikes along grooves that run directly into their mouths. Thorny devils live in the sand country of Central Australia. Thorny devils live on a diet of nothing but small black ants. They feed in the cooler mornings and late afternoon. When they locate a trail of ants they licks them up with their short, sticky tongue. Scientists calculate that thorny devils might eat a thousand or more ants in a single meal. Aerial predators such as brown falcons. Thorny devils can live up to 15 years. 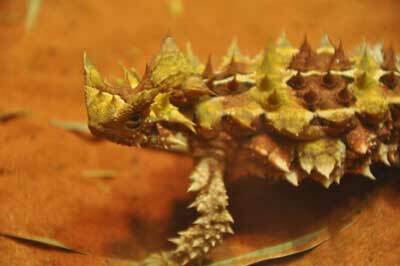 Thorny devils grow up to 15cm long. The females are larger than the males as they produce eggs.